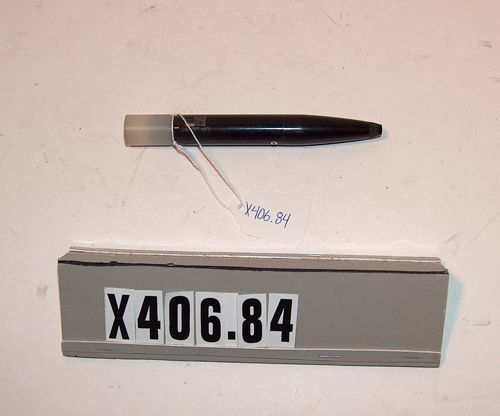 Other number ESL-7849CN005 on side of pen. 3/4 x 6 1/4 x 3/4 in. Engraved text: ESL-7849CN005 MOD #2 Constructed as part of project MAC. The ESL display console was I/O for an IBM 7094. "Automatic Light Pen Tracking. Another important function of a display system is graphical input- and a very useful technique for accomplishing this is light pen tracking. The usual programmed tracking (periodically displaying a tracking pattern- testing light pen response- and calculating new coordinates- all under program control) typically requires about 10 percent of a computer's time for adequate performance. In order to reduce this drain on computer capacity- the function of the pen tracking has been completely implemented with hardware on the ESL Console." from "Display Hardware for Dynamic Man- Machine Interaction" by John E. Ward June 7-9- 1966. This pen provided improved pen-to-phosphor seperation by including a focus adjustment. The IBM 780 (?) scope- on which the pen was used was not designed with light-pen use in mind. It had a canted faceplate to reduce reflections. The phosphor-faceplate separtation varied between 3/4" to 2"over the screen- and the resulting gain and field-of-view variations of the light-pen were therefore unacceptable.